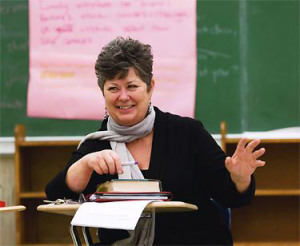 Linda Christensen is the Director of the Oregon Writing Project that is located in the Graduate School of Education at Lewis and Clark College. Christensen wrote Reading, Writing, and Rising Up: Teaching About Social Justice and the Power of the Written Word and Unlearning the Myths that Bind Us. She has spoken at local, national, and international conferences about her work. Christensen argues that schools need to help students acquire tools to interpret the media and other cultural texts in order to recognize stereotypes. She also stresses that teachers need to help students take action in expressing their critiques. "I start by showing students old cartoons because the stereotypes are so blatant. We look at the roles women, men, people of color, and poor people play in the cartoons. I ask students to watch for who plays the lead. Who plays the buffoon? Who plays the servant? I encourage them to look at the race, station in life, body type of each character. What motivates the character? What do they want out of life? What's their mission? If there are people of color in the cartoon, what do they look like? How are they portrayed? What would children learn about this particular group from this cartoon?" (p.129). If teachers make their students aware of the 'secret education' that cartoons give people then the students will be able to make better choices. Christensen is saying that people need to speak out on what they believe is wrong in media. Similarly, Johnson says that people need to speak out against the issues of privilege, power, and difference so that people can make a difference.